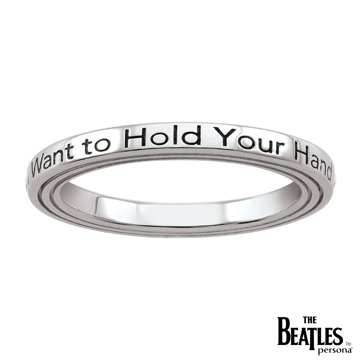 One of the most popular Beatles' song of all time, and a very sweet sentiment - I Want To Hold Your Hand, is engraved on this sterling silver ring. The CZ stones set between the song titles add a subtle hint of sparkle, and grooves etched into the side of the ring are inspired by the texture of a vinal record for a rock and roll vibe. One of the most popular Beatles' song of all time, and an important message - Let It Be, is engraved on this sterling silver ring. The blue CZ stones set between the song titles add a subtle hint of sparkle, and grooves etched into the side of the ring are inspired by the texture of a vinal record for a rock and roll vibe.